with part of the collection of wagons in the foreground. Founded in 1928, the Eastern California Museum features exhibits that reflect the diverse natural and cultural heritage of Inyo county and the Owens Valley. Unique exhibit topics include the artistry of local Owens Valley Paiute and Shoshone Indians as demonstrated through basketry and other crafts, and the story of Manzanar, the Japanese American World War II Internment Center. The site of Manzanar also was home of Indians for hundreds of years, and of the irrigation community developed by George Chaffee in the early 1900s. 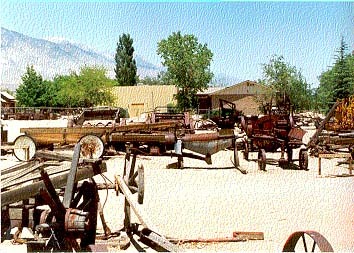 Also included on the museum grounds is Remnants of an Abandoned Landscape --- a collection of historic agricultural and mining implements used by early Inyo County Residents, and equipment used during construction of the Los Angeles Aqueduct. The museum gift shop offers a wide selection of educational material regarding Inyo County and the Eastern Sierra. While visiting Independence, see the Slim Princes Locomotive #18 in Dehy Park. A gift from southern Pacific Railroad, the locomotive ran on 300 miles of track extending north through the Owens Valley into Nevada. Also located in Independence and operated by the Museum is the Commander's House, an 1880's home built from lumber recycled from the remains of Camp Independence, a military outpost established in 1862 (open seasonally for tours). In addition to exhibits, the Eastern California Museum offers resources for research including an historic photograph collection, our Local history Files, transcripts from our Community Oral History Program, and the Frank Parcher Memorial Library. Research access is available by appointment. Open daily (except Tuesday) from 10:00 a.m. to 4:00 p.m. closed Tuesdays and some major holidays. The Eastern California Museum is operated by the County of Inyo. there is no admission charge, but donations are appreciated. The museum can provide tours for schools or other special groups. Please contact the Museum to make special arrangements. The Manzanar National Historic Site, operated by the National Park Service, is located 5 miles south of independence on U.S. Highway 395. The information on this page is from "Eastern California Museum"
a publication of the Friends of the Eastern California Museum.